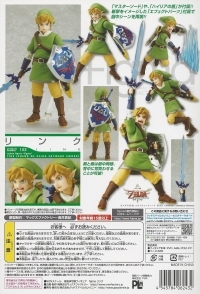 Box Text: One of the most iconic videogame characters of all time, Link from the "Legend of Zelda" games, will soon be a fantastically posable Figma! Link is represented as he appears in the newest game in the series, "The Legend of Zelda: Skyward Sword," and he'll come with two facial expressions, the Master Sword and Hylian Shield (which he can carry on his back if you choose). A stand with a posing arm will also be included. Order him today, and become part of the legend! 01-02-2013 mudkip25 Box Text One of the most iconic videogame characters of all time, Link from the "Legend of Zelda" games, will soon be a fantastically posable Figma! 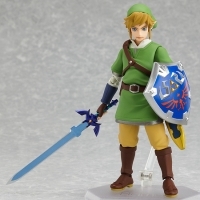 Link is represented as he appears in the newest game in the series, "The Legend of Zelda: Skyward Sword," and he'll come with two facial expressions, the Master Sword and Hylian Shield (which he can carry on his back if you choose). A stand with a posing arm will also be included. Order him today, and become part of the legend! This is a list of VGCollect users who have figma Action Figure Series: Link - The Legend of Zelda Skyward Sword in their Collection. This is a list of VGCollect users who have figma Action Figure Series: Link - The Legend of Zelda Skyward Sword in their Sell List. 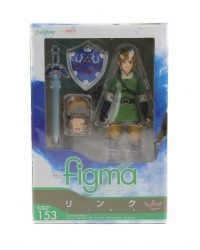 This is a list of VGCollect users who have figma Action Figure Series: Link - The Legend of Zelda Skyward Sword in their Wish List.